Atlantic Avenue - Full Day Session- Register now! Discounts available for registering for more than three days per participant in a single purchase (2% for three days, 5% for four days, 8% for five days). We share our knowledge of mechanical engineering and electrical principles with kids in a fun and engaging way. We bring out toys and models that help convey how electricity, gears, motors, and other things work. We always reinforce their learning by calling on prior knowledge and experience. The sessions are fun. Super fun! It’s our goal to make sure the kids all have a blast while doing and learning awesome things. No previous robot experience required! Our day-long sessions run from 9a-3p. We often offer an extended day option (until 6pm). If you do not see this option at registration, but would like it, please contact us. We offer two registration options daily: our standard Robot Builders program, for children in grades K-4, and our Robot Inventors program, for more experienced students in grades 3-5. 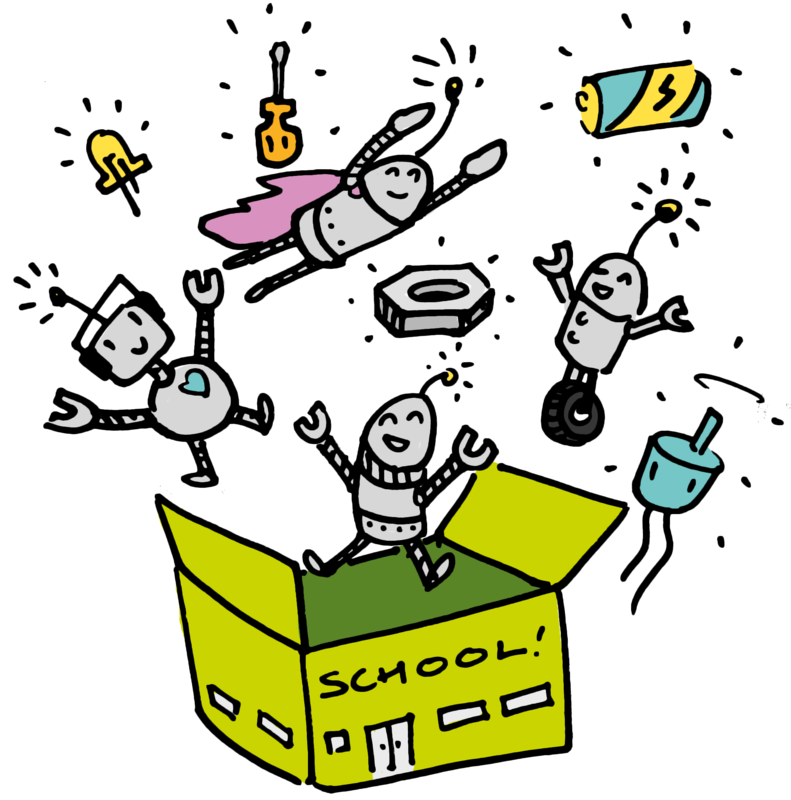 Most children will enroll in our standard Robot Building program. This option is for children in K-4th grades. Students will build and take home 2 awesome projects per day! 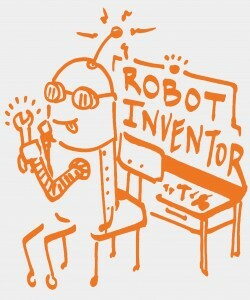 We offer a limited number of Robot Inventor spots each session, for returning students in 3rd-5th grade who are now ready to make their own creations! This option allows our more experienced students to create and build whatever they want during the session. It also allows different age siblings to be enrolled in age-appropriate programs on the same day. Did my registration go through okay? If you completed the registration process, the last thing you will see is a confirmation screen. You will also receive an email confirming your order. If you didn’t get to a screen where you entered your email address and credit card information, then you didn’t complete the registration. When is morning drop-off? Our doors open at 8:40 am. Class officially starts at 9:00 am. When is pick-up? Pickup is at 3:00. Will you be offering an extended day option? We often offer an extended day (until 6pm). If you do not see this option at registration, please contact us to see if it is possible. Extended day requires pre-registration..
Will food/lunch/snacks be provided? No, we do not provide food. Please send your child with a packed lunch and snacks that do not contain any nuts or peanuts of any kind. Some programs that my children attend require medical forms from our doctor. Does your program require this form? No, we do not need that form. We just need you to fill out all information during the registration process which includes general medical questions about your child. My child has a scooter. Can they store it at the Foundry while they are in the session? Sure! But we don’t have room for bikes and strollers to stay the full day. Will my child take the robots home? Yes! One of the criteria we use when designing our activities is selecting materials and projects that kids can continue to work on and tinker with after the program is over. Will there be outside time each day? We always try to spend some time outside every day. Please send your child with appropriate clothing (raincoats, sunblock, etc). My child has never built robots before, is that okay? Sure, no problem at all! They don’t have to have any experience, we will teach them all they need to know. What is the child to teacher ratio? The ratio is about 6 children to one adult staff member. Who are we? We started Brooklyn Robot Foundry to inspire and motivate kids by teaching them about the fun of building. We love the idea of learning and coming together through making things. We believe in the DIT—do it together— mentality and the importance of building a community around this common goal. We have backgrounds in mechanical engineering, software, education, music and fine art. We strive to make an environment that is educational, community based and most of all fun.